Homer (Population 5.390) is located on the Kenai Peninsula on the north shore of Kachemak Bay, 226 miles by highway or 40 minutes by jet aircraft from Anchorage. Visitor information: Homer Chamber of Commerce, 201 Sterling Highway, Homer 99603; phone during business hours (907) 235-7740. Homer, named for local prospector Homer Pennock, was established on the north shore of Kachemak Bay at Homer Spit in 1895. A long, narrow gravel bar jutting out more than 4 miles from shore, Homer Spit is the site of a major dock facility, Homer’s state ferry terminal and small-boat harbor. The harbormaster’s office, canneries, parking/camping areas, charter services , small shops, live theatre, galleries, dining, motels, lodges and resorts, and bed and breakfasts are also located on the Spit. The main road on the Spit is the Sterling Highway, which is also the main road through Homer. Homer’s picturesque setting, mild climate and great fishing (especially for halibut) attract thousands of visitors each year. The “Halibut Fishing Capital of the World”, Homer’s commercial fishing industry is an important part of its economy. Homer is also home to a large community of artists. Potters, sculptors, painters and jewelers practice their crafts and sell their goods in local shops, weekend markets and galleries. Homer has a post office, library, laundromats, supermarkets, gas stations, banks, churches, schools, a hospital and an airport terminal. Boat repair, marine fuel, fish processing, bait and tackle available locally. Halibut Cove (Population: 23) is located on the east shore of Kachemak Bay, 7 miles southeast of Homer, and is accessible only by plane or boat. The bay was named Halibut Cove by W.H. Dall of the U.S. Coast & Geodetic Survey in 1880. Between 1911 and 1928, Halibut Cove had 42 herring salteries and a population of about 1,000. 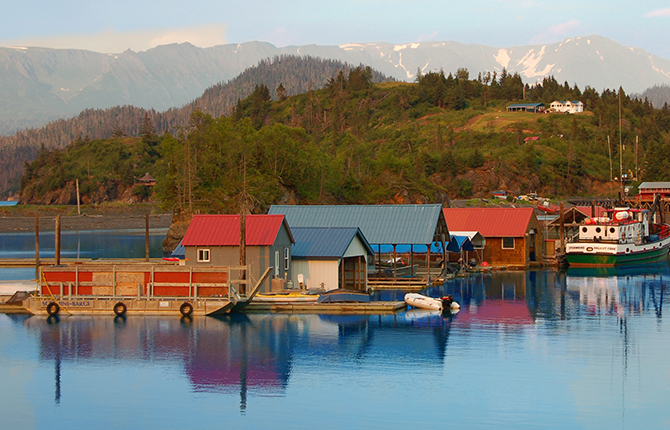 Today, the community of Halibut Cove is made up of self-employed artists, commercial fishermen and craftsmen. There is a post office in Halibut Cove, but there are no state schools, banks, grocery stores or similar services available. Overnight accommodations available at local lodges, cabins and bed-and-breakfasts. There is one restaurant, the Saltry; reservations are required. There are also no roads in Halibut Cove: homes and businesses are connected by boardwalk. Stroll the boardwalks for spectacular views of Kachemak Bay. Visit local galleries displaying the work of resident artists. Hike Kachemak Bay State Park trails. Try kayaking, clamming, tide pooling and beachcombing along the shoreline. Pratt Museum visual, audio and interactive exhibits, web cam broadcasts, films and lectures introduce visitors to the region’s natural and cultural history. Alaska Islands and Ocean Visitor Center exhibits and films take you on a virtual tour of the 4.9-million-acre Alaska Maritime National Wildlife Refuge. Visit Homer Spit with it's fishing charter services and a variety of shops and restaurants are housed in the Spit’s unique boardwalk structures. Photograph Spit landmarks, like the Seafarer’s Memorial and Salty Dawg Saloon.